It’s hard to draw flowers when your heart is full of stress and worry, but today was a little better than how the last crazy week has been, so I’ve given the Dichondra another go. That’s not too bad. The stem and that one tiny light leaf should stitch up more green and less yellow. And you can’t really see it, but there are little purple anthers. Hmm. I think I need to go back and put in one more petal-color stitch at the bottom center of the fully open flower. But I think I like it! Wow. That’s actually going to be a heck of a lot of stitching. There are a lot of stitches in those leaves. And I think it looks Gerda-ish. What do you think? Remember our friend Scarlet Pimpernel? I tried a sketch, and I don’t love it. Even though the petals can be pointed, I think the shape is just wrong here. I need rounded petals, and shorter flower stalks Back, as they say, to the drawing board. I’ve had a little more luck with Ponysfoot, Dichondra carolinensis, which is in the morning glory family. It’s mostly a weed here, though in other places it’s grown as a lawngrass substitute. (It certainly would like to take over my lawn!) The stems run along the ground and root at the nodes. It has cute round leaves and teensy flowers that are whitish, pale green, or pale yellow. Many people don’t know it has flowers at all, because you have to get down on their level to appreciate them. Who wouldn’t like purple anthers? I’m quite happy with the leaves and stem in the sketch below, but the flowers are… what? Too large in proportion to the leaves, I think. They can’t all work on the first try! The smallest of our local bluets is Houstonia micrantha, the Southern bluet. That specific epithet means “tiny flower,” and boy, do they live up to the name! The white blossoms are only a few millimeters across. Houstonia rosea (the pink one) is shorter, but has larger flowers. Photo by J. K. Marlow. It’s not unusual to find white-flowered individuals of H. pusilla in a population, but the size of the corolla and the stature of the plantslet you know they’re not H. micrantha. Here is a pretty dirty sketch. I didn’t like that one side-view flower, so I redrew it above. And the hand-drawn chart, with corrections and color notations. Here’s the chart as output by the program. It’s hard to see the stems. A good printout (rather than a screen-cap) would have them as distinct black lines. I think, on a background sufficiently distinct from white, I won’t need to outline the flowers or delineate the border between the tube and the flared part of the corolla. (Botany lesson: the term for flowers shaped like this is salverform, with the narrow part of the blossom termed the tube, and the spread-out part is called the limb. And see–they do play well with the blue ones! I’m still not sure they look like something Gerda drew, but I’m pretty happy with them. I’ll try to make sure the next plant I chart up is one Gerda also did, so that we can make a direct comparison. 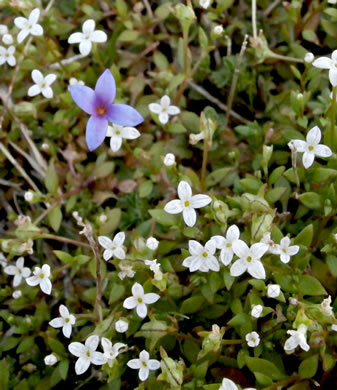 East Texas has another spring wildflower that’s as tiny as bluets. Often they grow together, and I’ve seen at least one herbarium sheet that was a mixed collection (oops!) Rather than purple, bluish, pink, or white, however, Golden Hedge-hyssop (Gratiola flava) has flowers that are a bright, clear lemon yellow. This little member of the Figwort family is tiny. Written out, the common name is longer than the plants are tall! Belly botany, for sure. Texas’ other species of Gratiola are all much bigger. Gratiola flava only grows in areas of loose sand and is endemic (found in a limited area) of East Texas and Louisiana. I used to see them at Lick Creek Park all the time, when I was out there more often than I am now. The paired leaves vary from oval to long-elliptic, and the tubular flowers are slightly curved. The petals are fused, with the corolla having four lobes—one of which is larger than the other three because it is actually two petals fused together. The fruits are pointed-ovoid. This is another plant I’ll have to draw twice or more life-sized to capture detail and then stitch over-one. First approximation of a chart, with notations as to color. I’ve started a color/symbol list for my charting program so that the same symbol will be the same color in any of my charts. Fewer headaches that way! I won’t have to rechart if I combine designs. Again, the charting program doesn’t handle colors perfectly, particularly the yellowy greens. I did the foliage in three different colorways. I may adjust the colors of the flowers when I stitch, because there needs to be enough difference so that you can see the tube, the spread corolla, and the deeper-toned middle (deeper only because of shadow–the flowers really are just solid lemon–DMC 307). The colors of floss I specified aren’t very different in the program. I think they’ll be more distinct in actual floss. And here is what the little plants would look like stitched on taupe. Stitching will have to wait, because I want to do a group of different teeny-tinies all together and, depending on how I arrange them, I will probably need to shift the foliage colors around for balance. Can’t have all the DMC 3346 ending up on one side of the work, now can we? Don’t let the name fool you—not all bluets are blue. Houstonia rosea comes in shades of pink, from rose to pale purply-pink. The plants are even smaller than Houstonia pusilla, the bluets I charted first, but their flowers are proportionately bigger. Their middles are yellow or greeny-yellow, rather than green. (It’s H. caerulea, a bluet we don’t have, that has the sunny yellow middles.) Often, the flower shades to white or very pale pink between the outside of the corolla and the middle. So at lunch today, I drew a few. Squee! They are so cute. * I may tinker with them a bit. The fruit on the third one is clunky. But mostly, I’m happy with them. They are going to play nicely with the blue ones, too. Sorry, Marshall. These little guys are cute. I really want to do a long banner-like piece with some of the overlooked spring flowers. That… That is a lot of plants. Can’t forget the plants of Lick Creek Park. And I have so many pleasant memories of the bogs in Leon County. Not to mention mucking about in wet ditches. I managed to think of some favorite plants from the outcrop in Grimes County where the plant I named grows. Now, these lists may not all end up as large pieces, with multiple plants per design, but they do form coherent assemblages. I can make individual designs or multi-plant designs. I had probably come up with a standard set of symbols, though, or when I start combining individual charts into bigger ones, there is going to be a ton of confusion. There are some plants from Uvalde County that are worth immortalizing in thread. “Gaillardia amblyodon” is just fun to say. I ought not forget the fall wildflowers–though climate change has half of these blooming in the summer now. I think it would be fun to do a big panel with nothing but members of the bean family. And if beans, why not mints? Mints are nifty. There should be a Trans-Pecos list too, at some point. And you’ll notice there aren’t any trees and shrubs. That’s a whole ‘nother ball game. Stop! Breathe, Monique. Just pick a plant that calls to you and draw the darned thing.